First Evidence Surfaces of Foreign Money Pouring into U.S. Elections After Citizens United | Democracy Now! AMY GOODMAN: Six years ago, President Obama warned the nation that foreign corporations could soon pour money into the U.S. election system, thanks to the Supreme Court Citizens United decision. Obama made the warning during his 2010 State of the Union speech as members of the Supreme Court looked on. PRESIDENT BARACK OBAMA: With all due deference to separation of powers, last week the Supreme Court reversed a century of law that I believe will open the floodgates for special interests, including foreign corporations, to spend without limit in our elections. I don’t think American elections should be bankrolled by America’s most powerful interests or, worse, by foreign entities. They should be decided by the American people. And I’d urge Democrats and Republicans to pass a bill that helps correct some of these problems. AMY GOODMAN: That was President Obama speaking in 2010. Now, for the first time, direct evidence has emerged showing a foreign company has indeed donated money to a federal campaign. Documentation obtained by The Intercept shows a company owned by Chinese nationals donated $1.3 million to Jeb Bush’s super PAC after receiving advice from a prominent Republican lawyer. On Wednesday, The Intercept published a multi-part series looking at the actions of two Chinese citizens living in Singapore who own a U.S.-based firm called American Pacific International Capital, that has ties to the Bush family. Jeb’s brother, Neil, serves on the corporation’s board. The Intercept reports suggest there might be more such instances of foreign contributions, as the 2016 election has witnessed a surge of contributions to super PACs by so-called ghost corporations, whose ownership remains unknown. Welcome back to Democracy Now! It’s great to have you in studio live for the first time. LEE FANG: Thank you for having me, Amy. AMY GOODMAN: So, Lee, why don’t you start off by talking about how Citizens United opened up the floodgates for money—now, in fact, foreign money—and where super PACs fit into this? 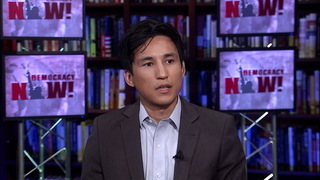 LEE FANG: In 2010, the Supreme Court decision Citizens United rolled back about a hundred years of campaign finance law, basically doing two things: one, allowing corporations and unions to spend unlimited amounts in this election; and, two, separating the way we look at campaign finance. No longer can we trace all donations back to individuals; instead, fictions of the state, corporations and other legal entities, could contribute unlimited amounts. AMY GOODMAN: So talk about this many-month investigation that you have done and, again, how super PACs fit into this and open up the floodgates. LEE FANG: We worked on this for several months. I wrote this with my colleague, Jon Schwarz, and a freelancer, Elaine Yu, along with a fantastic team at The Intercept of researchers and editors. We simply looked at some of the largest corporate donations to presidential super PACs and tried to find out their ownership structure. By chance, we found that one of the largest corporate donors to the Jeb Bush super PAC, Right to Rise, was owned—or, is owned by two Chinese nationals. They’re permanent residents of Singapore. And they gave $1.3 million to the Jeb Bush super PAC. They were advised by one of the most prominent Republican campaign lawyers in the country, Charlie Spies. Charlie Spies has a very long history in big money politics. He was an adviser to George W. Bush’s campaign, to the Republican Governors Association. He helped set up the massive Mitt Romney super PAC. And he set up the Jeb Bush super PAC. He, in fact, wrote a memo that is essentially a roadmap for how foreign-controlled domestic corporations may give in U.S. federal elections, basically setting all the parameters and rules inviting these types of donations. So this wasn’t an anomaly. And he wrote this memo, that we obtained and published with the story, in February of 2015. And the donation from the American Pacific International Capital Company—this is the company controlled by two Chinese foreign nationals—provided their $1.3 million donation to the Jeb Bush super PAC one month later. AMY GOODMAN: And explain who this couple is. LEE FANG: Gordon Tang and Serena Chen, they’re Chinese nationals. They amassed their wealth living in southern China, in Shantou. They had an import-export business with various goods that they sent abroad. They now have a very large diversified company that has a biofuel refinery, various investment properties, luxury towers, malls, other commercial property in southern China, Malaysia, Singapore. And over the last seven years, they’ve been amassing a large portfolio in the U.S., as well. AMY GOODMAN: And Jeb Bush’s brother, George W. Bush’s brother, Neil Bush, sits on the board of APIC? LEE FANG: That’s right. Neil Bush was appointed to both APIC’s board and a sister company also controlled by Gordon Tang called the SingHaiyi Group. We don’t know the compensation from APIC, but through the Singapore Stock Exchange, we know that Neil Bush has been paid at least $700,000 for serving on the SingHaiyi board. And he’s been a prominent kind of figurehead for the company, appearing on company documents, giving speeches and appearing in the Singapore media on behalf of the company. AMY GOODMAN: And how does Gordon Tang also connect with the former governor of Washington, Gary Locke? LEE FANG: Yeah, this is an interesting angle to the story. In addition to providing the first documented case of a foreign-controlled corporation giving to an American super PAC, a presidential election vehicle, this is also a story about incredible influence peddling. Gordon Tang and his company worked meticulously to gain U.S. political friends, as his brother-in-law called it, bringing U.S. politicians to his ribbon cuttings, and also soliciting the help from Gary Locke, the former governor of Washington, former secretary of commerce for Obama and the former U.S. ambassador for Obama to China. Locke worked briefly for APIC in 2008, went into government serving the Obama administration, and while serving as ambassador to China, was looking to sell his house, and sold his home in Bethesda to the—to Tang’s family for $1.6 million. It was a very unusual transaction for a sitting ambassador to sell their home to a foreign national of the country they were serving in. AMY GOODMAN: I want to get to an exchange between Gordon Tang and reporter Elaine Yu, who is working with you at The Intercept. When she asked him about rumors about his past, he offered her a bribe. This is an excerpt from an audio recording of their exchange. GORDON TANG: [translated] I’ll come to Hong Kong later and give you a red packet of $200,000, so we can be friends. I shall arrive at Hong Kong on July 20th, for five days, and leave on the 25th. I hope to see you, and then we can be friends. I don’t even know why you want to be a reporter. Reporters make so little money. ELAINE YU: [translated] OK, we’re really more interested in the Sino-U.S. relationship. What about SingHaiyi, Neil Bush? What do you think are his good qualities? I want to understand the attitude of how Americans do business. GORDON TANG: [translated] Once we’re friends, I’ll have a lot to tell you. And we shall be friends if you don’t write about the last three points [i.e., the rumors about his past]. AMY GOODMAN: That’s Gordon Tang speaking to Intercept reporter Elaine Yu. And he called her from the airport in Hong Kong to say he had an envelope for her, a red envelope. LEE FANG: That’s right. He had a lai see, which is a traditional Chinese envelope for giving gifts. But he offered what is essentially a bribe not to report certain aspects of the story, offering $200,000 in unspecified currency. AMY GOODMAN: What was he so concerned about? LEE FANG: He was concerned about allegations about a company he controlled that was investigated for smuggling and tax evasion in Shantou. AMY GOODMAN: And was he implicated? LEE FANG: Members of his family and his business were implicated. And that does it for our show. We have two job openings. We have a development manager and a senior video producer. 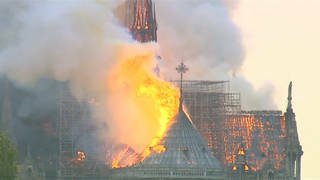 Go to democracynow.org for the information.